The life of a capitalist wage slave is not pleasant once you know how badly you’re getting screwed by your capitalist “friends”. 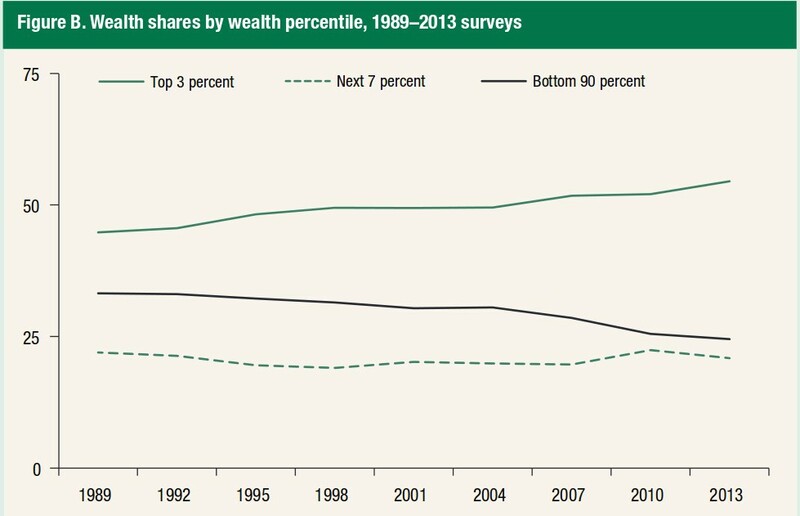 Recent Trends in Wealth Distribution in USA, 1989-2013. Federal Reserve Bulletin, p. 11. Why do we call for a workers socialist revolution rather than just fight for reforms of the capitalist system? 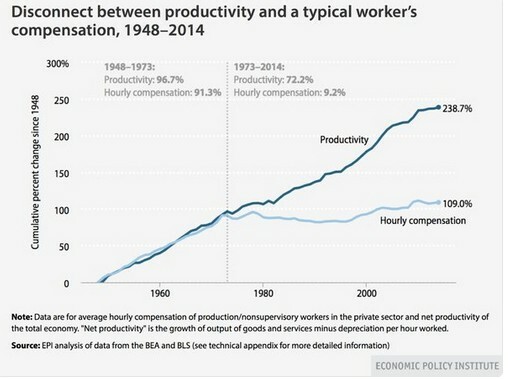 It is because all of the major social problems in the world today: hunger, homelessness, racism, sexism, lack of health care, environmental destruction and war – can be solved once and for all (not just made slightly more tolerable) once capitalism is replaced worldwide by egalitarian socialist workers republics working together as one united human race. War and starvation can actually become nothing but memories of our barbarous past if we follow the road of socialist revolution. The capitalist world has – for a century now – had all the knowledge and technology it needs to END hunger, homelessness, war, sexism, environmental degradation and all the social ills that plague modern capitalist society. The only reason that these problems were not solved decades ago is that we live under a capitalist system where the mad drive for profits and ever more profits places the needs of wealthy individuals above the needs of the vast majority of the human race. If it isn’t profitable to feed, clothe, house and provide health care and education for the people on the planet then the capitalists will not solve those problems. It’s as simple – and as repulsive – as that. Back in the 1990s the United Nations promulgated a massive global scam called the Millennium Development Goals. They proclaimed to the world that in the new millennium, capitalism – having “proven” its superiority to the just-collapsed socialist model of the USSR – would lead a global effort to “eradicate” “extreme” poverty, homelessness and starvation and provide universal education and health care across the capitalist world – by 2015. “Extreme poverty” was lowballed in the Millennium Development Goals as people forced to live on $1.25 or less per day! The targets of the MDGs were carefully worded to give the UN the maximum “wiggle room” to claim “victory” no matter how little real progress was made to solve any of the enormous problems they pretended to address. To much fanfare, every major capitalist country loudly proclaimed its ardent desire to “fulfill” the vague MDG targets and had the representatives of their nations sign the MDG agreements. Almost 20 years later they have largely failed to make a dent in their “goals”. The leading capitalist countries refused to provide the funding necessary to even begin to reach any of them; and every time the capitalist world suffers yet another of its endless series of economic heart attacks, they cut their funding for the MDG and fall further behind. In the past few years, they have stopped talking about their own phony Millenium Development Goals and have started to jabber about a vastly scaled-down effort at pursuit of “Sustainable Development Goals”. In place of the “mandatory” national funding schemes initially promulgated they have largely substituted petty, piecemeal private charity work, which merely is capable of giving the impression to the gullible in the “first world” that “something is being done” for the billions of the capitalist world’s poor. The truth is that capitalism will not and can not solve the problems that the capitalist system itself creates and perpetuates. Only a globally planned socialist economy could harness and distribute the resources necessary not just to reduce “extreme” poverty but eliminate poverty itself. Racism, religious bigotry and sexism exist and are constantly encouraged by the racist, sexist and religiously intolerant capitalist classes of the world for one reason: profits! By keeping the working class divided along these many lines, the capitalists can prevent the workers from joining forces against capitalism and fighting effectively for better wages, benefits and living and working conditions. Fascist parties are financed and organized by the capitalists and the monarchist aristocrats of the world to destroy any possibility of the workers organizing across racial, ethnic, religious and sexual lines. Revolutionary socialists like us seek to organize ALL the workers of the world into an internationalist federation of workers parties, so that we can end the dictatorship of the capitalist minority over the vast majority of the population of the planet. Modern revolutionary socialism (properly called “Trotskyism”) seeks not merely to organize the working class to impotently “speak truth to power” but to place the working class in power by overthrowing the wealthy capitalist class and their state and substituting the working class and a workers state in its place. When the working class runs the government, we can easily put human needs first and set out to harness the technology and productive capacity of modern society and place them at the service of the entire human race – not just the top 10%! The goal of the revolutionary Trotskyists is to feed, clothe and shelter ALL the world’s people, and at the same time provide all the resources necessary to build schools and hospitals all over the world so no one goes without an education or quality health care. (An example of the huge changes that could be made through education alone: the more highly educated women are, the fewer children they choose to have; this could lead to the end of runaway growth of the world’s population). War – like poverty and racism – doesn’t happen by accident; it happens because the world is divided into competing capitalist nation-states that are constantly battling with each other for access to raw materials, markets and cheap sources of labor in order to maximize their profit margins. The problem is that the world was divided up long ago; there is no way for the competing capitalists to obtain access to new sources of raw materials, markets and labor without coming into conflict with one or more of their competitors who are also seeking access to the same resources. When they can’t negotiate an agreement, war becomes the best option. Likewise, if a national government or its citizens do not wish to have their natural resources plundered by foreign capitalists, the foreigners, like the USA, use their secret services (such as the CIA) to topple those governments and put compliant puppet governments in their place. If the workers try to oppose the new puppet government, the US provides its satraps with all the guns and military training needed to crush the workers movement and kill its leaders. The capitalist classes stopped being capable of progressive change on their own initiative back in the late 1800s. In the US, the last time the capitalist class organized itself to do anything truly progressive on its own was when they organized the Civil War to smash the southern slaveocracy. The initiative for EVERY progressive idea since the mid-1800s to now – the fight against slavery; the fight for equal rights for people of color; the fight for an 8 hour day; union rights; the fight for equal rights for women and gays… has come from the working class! The capitalists only make concessions to the workers’ just demands after a prolonged struggle in which many workers’ leaders are killed by the capitalist class cops and military, and only after thousands of workers are thrown into jails or shot down in the streets. This has been just as true in the so-called “civilized” advanced capitalist countries as it is in the “third-world” countries. Modernization of production lines with automation and computer technology has made the rich far richer, while providing a declining standard of living for the working class. Modern technology is used not to make life easier for everyone on the planet but to increase the profits of the capitalist class. Whenever new labor-saving technology is introduced into the capitalist system it ends up enriching the few – the capitalists – and throwing millions of workers out of work. In the past half-century, worker productivity – the amount of work done per worker per hour – has vastly increased, allowing companies to savagely slash payrolls and cancel expected future hiring. Unemployment has skyrocketed and millions of people are no longer counted as being unemployed in “official” records merely because they have given up on finding a decent-paying job. This trend will continue under capitalism and is set to increase at an even faster rate. New “self-driving” cars, trucks, trains and planes will throw millions of human drivers, engineers and pilots out of work, permanently, simultaneously wiping out the last vestiges of union power in the USA. The time for us to fight against such a hideous future under the capitalist system is now! Under socialism it would be possible to use technological advances to reduce working hours with no loss in pay until workers would no longer have to work at all – the machines would do all the work – and the workers would continue to get paid as before. Advances in technology would reduce the need for workers just as under capitalism; but under socialism it would mean a benefit for the workers because as the need for labor declined so would the length of the workweek! Productivity would continue to increase and the more dehumanizing repetitive production and transportation jobs would no longer need to be staffed by bored workers. Human beings could take advantage of free higher educational opportunities to learn how to do more interesting and fulfilling jobs instead of dead-end production line work… with no cuts to anyone’s pay or benefits! Under capitalism, the no-longer-needed working class has a future of life on welfare at minimum wage, while the fully-automated Pentagon killing machine puts down every worker rebellion that erupts from time to time. One of the top goals of a socialist rationally planned global economy would be to find ways to reverse the damage to our planet’s environment wrought by the destructive chaos of capitalist production methods. Environmental destruction seems under capitalism to be an inevitable part of the capitalist idea of “progress”. Everywhere we look we see forests being cut down for short-term profits; mountain ranges destroyed for easy access to coal and ore deposits; wildlife habitat wiped out for the benefit of greedy profit-making schemes; and not least of all, indigenous people driven off their ancestral lands to make way for the selfish goals of a handful of filthy rich people. In the socialist countries as well, “economic progress” has come at a tremendous cost to the environment. Although for the most part, the economic benefits obtained by the workers at the expense of the environment largely actually benefit the workers in those bureaucratized workers states, in many ways the cost far exceeds any benefit. The Independent Workers Party seeks to develop a revolutionary socialist programme that fully incorporates long-term environmental planning into every aspect of socialist development. It makes absolutely no sense to place the interests of the human race in opposition to the interests of the environment. Human beings are an integral part of the environment and cannot survive at the expense of the planet itself. Rational scientific planning of large-scale, long-term socialist economic objectives is the only intelligent way to harness the world’s resources for the benefit of ourselves and our descendants. We have no idea how long human beings will be forced to remain on this one planet; it is therefore totally irresponsible and a betrayal of future generations to squander the planet’s limited resources in the way that the capitalist mode of production does. The working class came to a fork in the road of human development back in the late 1800s: one road led to the development of socialism under the leadership of the representatives of the working class; the other road to the continuation of capitalist exploitation of the many by the few. By bribing as many of the workers leaders as possible, and by killing off or imprisoning those who would not be bribed, the capitalists have been able to prevent the workers from overthrowing them in most countries. The result has been an endless series of economic depressions and endless wars – including World Wars I and II in which a hundred million workers were slaughtered and many of the major cities of whole continents destroyed. Only in Russia, China, North Korea, Vietnam and Cuba has capitalism been overthrown by the working class – and the Russian Revolution was overthrown and capitalism restored by its own venal Stalinist bureaucracy in 1989. If the working classes of the world do not overthrow the capitalist system soon, we will certainly see a third World War which would most likely be a nuclear war. A global nuclear war would kill many more people than WWI and II combined; and the environmental destruction that would follow in its wake would be devastating. We can prevent World War III from happening if we organize revolutionary socialist workers parties and disarm the capitalist class before they kill again! It is historically inaccurate to say that all the socialist revolutions have led to “less democratic” governments (what kind of “democracy” existed in Russia before 1917; China before 1949; or before the Korean, Vietnamese or Cuban revolutions?). The fact is that the revolutionary governments that arose in all those countries without previous histories of bourgeois democratic rule would prove to be far different from what a revolutionary workers government in an advanced capitalist country such as the USA would look like. In the “advanced” capitalist countries workers are used to participating in elections and having a say in how the nation is run. Under the regimes that preceded all the revolutionary socialist governments in the world the workers and peasants were completely excluded from participation in the national political life. We seek to create a workers government where the working class will elect representatives from their own political parties the workers themselves control and are members of – not from a slate of candidates pre-selected, financed by and answerable to the capitalist class as we have today here in the USA. The Trotskyist movement was created by the great Russian Revolutionary leader Leon Trotsky in opposition to the rise of the brutal Stalinist bureaucracy that viciously and stupidly ran the USSR into the ground in 1989. Thousands of Trotsky’s adherents were murdered by the Stalinist government of the USSR or died in the gulags. Trotsky’s own son and he himself were murdered by Stalinst agents. Our movement understands full well how brutal a Stalinist or Maoist socialist workers state can be! We have no intention of “bringing back” the anti-Marxist and counterrevolutionary “ideals” of the Stalinists or Maoists! Although we defended the USSR when it existed and we defend ALL of the Stalinist/Maoist workers states from any and all attacks upon them led by the capitalist states of the world, we do not seek to copy all their many hideous errors and brutalities. We have no desire to replicate the horrors of Stalinism or Maoism or the bizarre hereditary “socialist” monarchy of North Korea; we study the histories of these first attempts at bringing socialism into the world so as to learn from and avoid their many errors while learning from their many, many successes. As unnecessarily repressive as the modern bureaucratized workers state governments are, they are all far better than what they replaced! Capitalism was never able to feed all the people of China while the capitalists ruled there; every year tens of thousands of people died of starvation under the “old regime”; the Maoist revolution put an end to mass starvation and homelessness in China – brutally, to be sure, but they did it, and that is no small feat. The restoration of capitalism in China would bring tremendous suffering back to the working class of China, just like the disastrous restoration of capitalism in the USSR did. The restoration of capitalism in Cuba would drive down the standard of living there for the majority of workers to the level suffered by the workers of Haiti or the Dominican Republic. Look back at the series of vicious imperialist puppet governments in Vietnam; the horrors of the Japanese occupation that preceded the Korean and Chinese revolutions – the workers revolutions in every case brought far better governments to power. We seek to take all the best of those revolutions (free college tuition with a stipend; housing and health care and food as rights not as privileges) while creating a far more democratic society than exists in any of today’s bureaucratically deformed socialist countries. Likewise we do not seek throw what’s good about the current capitalist system in the USA with all the bad. The Bill of Rights of the USA would be expanded to include the right to housing, healthcare, education, food, clothing and jobs. Women’s rights and the rights of people of color and of all sexual identities would be fundamentally incorporated into a new Workers Socialist Bill of Rights; they would not just be “amendments” or”asterisks” in a document that was originally created to completely exclude women, blacks and everyone else not rich and white! The only people under a Trotskyist government that would see their rights taken away would be the capitalists, in precisely the same way that the monarchists lost all their rights after the American Revolution in 1781. There could be as many political parties as workers wished to create; the only stipulation being that pro-capitalist parties will not be allowed. For more than 90% of the citizens of the USA, that would be a positive blessing! Socialism cannot be pulled out of the crooked capitalist “magician’s hat” which the working class will find itself in possession of after the overthrow of the capitalist class. The Bolsheviks tried to “construct the socialist order” immediately after their brilliant 1917 victory – and fell flat on their faces. Their heroic attempt to create socialism out of the chaos of collapsed Czar-run capitalism – the first time anyone had attempted such a thing – was destined to fail. Under capitalism, there is no one who knows how the entire system works. No one person knows how goods make their way from the factories to the stores; how many hands they pass through. Food production and distribution in the USA is spectacularly decentralized. The capitalist system is the mirror opposite of rational planning. No one who works at a supermarket has any idea where any of the food is produced; no one has any idea how to contact the farmers responsible for feeding the nation’s millions in the event of a breakdown in the completely jury-rigged food distribution network. Most US states are not even close to self-sufficient in food production; some, like Massachusetts produce very little of their own food. Where does Chicago’s gasoline come from? Where is its electricity generated, and how? Where does the natural gas come from? The entire distribution network of vital goods in a capitalist nation-state is a sort of Rube Goldberg machine that has been knit together into a crazy-quilt of economic transactions that have evolved over generations. Woe to the “revolutionary socialist” who simply “overthrows” these systems before they have figured out how they work! This is why we call for a gradual transition from the current highly irrational, unplanned (yet somehow functional!) capitalist system of distribution to a rationally planned socialist system. The day after the workers seize power and depose the capitalist class, the new government will be responsible for feeding, clothing, sheltering and providing electricity and fuel for 370 million people! It will be like suddenly finding yourselves in a runaway capitalist economic stagecoach without a driver! The immediate task of the new government will be to keep the old system running as well as possible until we can grab hold of the reins and keep the whole system from going off a cliff. Only once we learn how the old system functions can we try to implement changes to the distribution network. To simply overthrow the current capitalist distribution system on day one would mean the collapse of the economy on day two. Certain things can be done more or less immediately – not without serious risks – like nationalizing banks, the hospitals, the communications networks. But commodities distribution must be allowed to run along capitalist lines until the entire system is comprehended and the producers are prepared to work within the new socialist system. Revolutionary reforms hastily enacted will almost certainly lead to the kind of chaos that developed in the young Soviet Union, which required the temporary restoration of capitalist production methods – only after the nation went through some brutal and bloody (and unnecessary) upheavals. There is only one force on Earth that can stop the next world war from happening: the power of the united working classes of the world… united as brothers and sisters into a powerful revolutionary socialist force organized to overthrow the capitalist system and replace it with egalitarian, internationalist socialism. The most advanced workers of the world are already aware of this fact and are busy organizing revolutionary Trotskyist workers parties to lead this struggle for a far better world for every worker and peasant on Earth. Will you continue to limit your political work to merely pressuring the hired politicians of the capitalist class to do the right thing? Will you allow your efforts to be limited to merely “speaking truth to power” with your heads obediently and humbly bowed before your “rightful rulers”- the bribed lackeys of the capitalist world? Do you have the courage to become a leader in the global fight to throw capitalism in the trash where it belongs and to create workers republics here in the United States and all over the world? The capitalist system must die so that the workers may live! Build revolutionary Trotskyist workers parties to fight for workers government around the world!